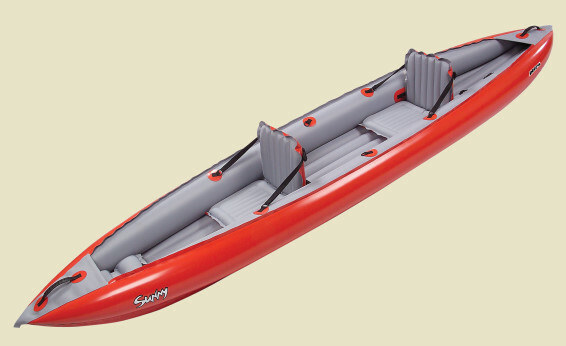 A solid boat based on the successful Helios 380, the slightly longer Sunny can be paddled as a single or double, with enough space for a kid or dog. Somewhat more stable than the Helios, the open cockpit Sunny is a true recreational boat designed for comfort and easy maneuvering. The Sunny packs compactly in its own drybag/backpack and can be set up in a matter of minutes. Hand-crafted with a heavy duty rubber coated 1,200-denier Nitrylon�, the Sunny will deliver years of paddling fun for a family of adventurers. The Sunny comes with a removable tracking fin. 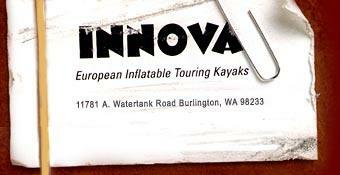 The Sunny can easily be changed into a balanced single kayak for solo paddlers. Because the boat is double-ended, the forward seat can be turned around and the tracking fin swapped to the other end to allow a solo paddler to sit in the middle of the Sunny. Made of Nitrylon.